In truth, this so-called “scam” involves nothing more than billing at-fault drivers for the Newburgh Heights police services that their negligent conduct requires. The bills are sent to the drivers’ insurance companies, which are contractually obligated to pay the fees for these police services, and the Village is specifically authorized by statute to collect these fees. Thus, what Defendants presented as a “scam” is not only entirely lawful but also a common-sense practice by which the Newburgh Heights officials ensure that their constituents aren’t stuck paying the price when at-fault drivers require service in the Village that their insurance companies are legally obligated to pay for. 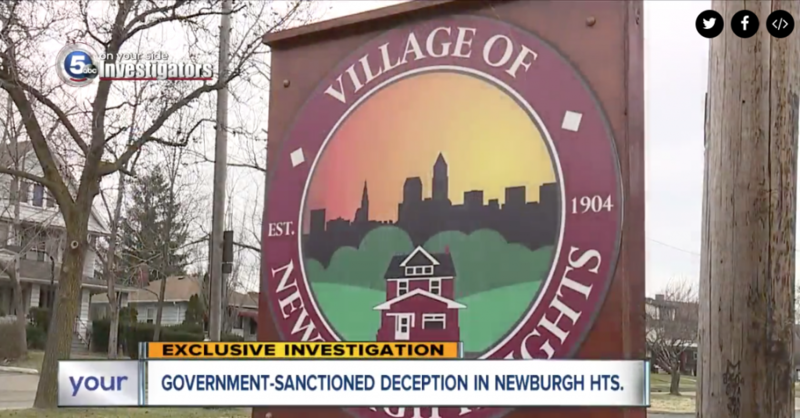 News 5 gave no regard to the legitimacy of this practice and the obvious public benefits in transferring costs from citizens to insurance companies, even though Newburgh Heights officials spent hours responding to Walsh’s information requests informing him of the same. Instead, the Defendants published a series of misrepresentations and outright falsehoods, including that Plaintiffs are charging people merely for “calling the police for an accident,” and “for getting into an accident.” The story also contains misleading interviews of two individuals who were never billed under the so-called “scam,” but whose opinions News 5 solicited as they were leaving Newburgh Heights Court after having been cited for driving under suspended licenses. Further, the story contains misleading references to the size of the Village’s police force, which consists mostly of part-time officers, and absurdly refers to the Village’s town hall and its “bay windows, crown moldings, and, chandelier,” to paint a false picture of an unlawful enterprise run cooked up to line the pockets of crooked government officials. As alleged in the Complaint, the outlandish nature of News 5’s misrepresentations reflects a deliberate intent to smear Plaintiffs’ reputations, and particularly that of Mayor Elkins, who is a rising star in the Cuyahoga County Democratic Party known for his progressive policies and willingness to question the local political establishment. News 5 published its false and defamatory report on November 2, 2017 only months after Elkins finished second in a contentious race for Cuyahoga County Democratic Party Chair, and Walsh first contacted Newburgh Heights officials about the story in February, only days after Elkins first announced his candidacy. Mayor Elkins and Council members Dorene Kray, Steven Moran, Brian Schaffran, and Robert Schippling are also represented by Attorneys Dean Williams and Dan Frech of The Pattakos Law Firm LLC. The case (Cuyahoga County No. CV-17-889733) has been assigned to Judge Kelly Ann Gallagher. A copy of the filed Complaint, which includes a copy of News 5’s defamatory report, is available here.